This is my go-to cigar! This cigar is great on a quick breaks as it offers plenty of enjoyment as compared to experiencing the similar effects from much larger sized cigars! I find the smoke smooth and handy for short breaks. Great Cigar! Best price around. The Centenario Cameo are my "goto" brand. Buy them every month. Cuesta Rey Centenario Cameo is rated 4.7 out of 5 based on 7 customer ratings. I like a quick smoke a lot of the time and was wondering how the draw is on these? These have an easy draw. Sometimes cigarillos have too good of a draw, since they are so small. This can can create a hot smoke on the palate. 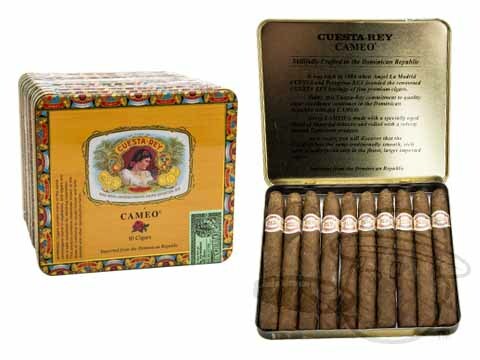 Cuesta Rey, though, is actually made by Arturo Fuente in the same factory which is owned by J.C. Newman, and Arturo Fuente cigars are known for their great burn and even draw.